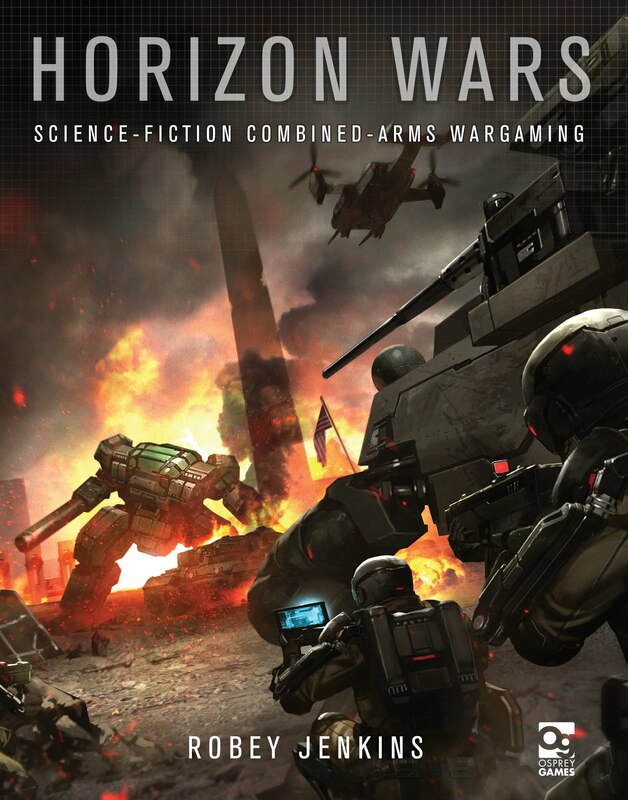 Horizon Wars is a set of sci-fi battle rules, written by Robey Jenkins and published by Osprey Publishing. Whilst the game does have its own ‘history’, this universe is not woven into the rules, and so the rules are essentially a set of generic rules which can be used with any figure range. Units are generically designed, and can have upgrades purchased for them, and so can fit in with any background the player wishes. It has to be noted that this game is designed to take place in a world where the ‘Mech’ (large humanoid battle robot) has been developed – in this universe; these units are the most advanced and dangerous on the battlefield. The game is designed to be used with models between 2mm and 10mm, and games can take place on anything from a 2’ x 4’ or 3’ x 3’ board, up to a 6’ x 4’ board, depending upon the size of encounter required, and a game can last from 30 minutes up to a couple of hours. As well as a playing area and miniatures (btw, there is no standard basing convention) you will need ten or more twelve sided dice (D12) in two different colours, a measuring tape marked in inches, some counters and a unit roster (there is a certain amount of book keeping involved in the game). Units are called ‘elements’ in the game, and can be one of four types: Infantry, Vehicles, Mechs or Aircraft. Each element has five stats: Presence, Movement, Firepower, Armour/Agility, and Defence. Presence is the cost of the unit, but is also used in close combat, Movement is the distance that can be moved in inches, Firepower is the number of dice rolled when shooting, Armour/Agility is a modifier number, and Defence is a number of dice that is rolled when being shot at. The turn sequence uses alternate unit activation. At the start of the turn, players each roll one dice, with the highest result being the player that can activate an element first. Each element has two actions. The actions are: Move, Shoot, Move and Shoot, Charge, Recover and Do Nothing. When moving, you can Cautious, Patrol or Rapid movement. Patrol allows an element to move at up to double movement, Rapid up to triple movement – but the element cannot then fire. The shooting mechanic is easy, but with some interesting twists. The range is checked (it is worth noting that no weapon has a stipulated minimum or maximum range in the game), and then the target’s Armour/Agility stat, plus any cover modifiers, are added to this total. This is the effective range. The shooter then rolls the number of dice equal to its Firepower (for example, Infantry typically have Firepower of 3, Heavy Tanks 5). The target rolls the number of dice equal to its defence. If any defence dice match the value of any firepower dice rolled, both are removed. The remaining dice are then grouped so that the total of the dice equal or exceed the effective range. For each group made in this manner, one point of damage is scored. Damage is then added to the damage track of the element, and the stats of the damaged element are then amended by that same damage value. If Movement is reduced to zero, an element can no longer move. If Firepower, then it can no longer shoot, and Armour being reduced to zero destroys the element. Charging is the equivalent of a close assault, and can be a short and deadly affair. The Recover action allows an element the chance to recover stats lost due to damage, although this becomes increasingly hard as more damage points are accrued. Once an element had performed its first action, any enemy element within line of sight can chose to react, and can move, shoot or counter charge (it is worth noting that elements can react and perform actions, but those actions do not have to be against the element that caused the reaction). The results of this reaction are then carried out before the original element performs its second action. Any element can only perform one reaction in a turn, and it spends an action to do so. Aircraft elements have their own rules for movement and shooting. The turn continues until all elements have spent all their actions, then a new turn begins. The game ends when the objective of the battle has been met. As I said, forces are somewhat generic in nature. There are three different types of Mechs, five types of infantry, five types of vehicle and three types of aircraft. Most elements (with the exception of Mechs) have fixed stat lines, but upgrades and special abilities can be purchased for each element, so units can be customized as the player sees fit, thus making their own, unique forces. Mechs are especially customizable, as each Mech can have its stats individually set by the player, with a maximum number of points available, depending upon the type of Mech. This system of army building gives the players complete freedom with army design, thus you can build any army to your own specification, and two armies built using the same design system should be equivalent on the battlefield. The book also contains rules for generating battles, notes on different suitable model ranges that are available, and an 18 page universe background, should you wish to use it. The background contains some suggestions on force building, but nothing concrete. It is likely that example of armies, and more advanced rules will become available from the author at a later date. There are a couple of omissions from the rules. The first is any form of morale system. This is very much by design, as the author made a conscious decision not to include morale considerations in the basic game. The second is any rules about cover – this is apparently an accidental oversight, as the rules where written but were somehow omitted from the final manuscript. Asa result, these should be appearing in the rules FAQ, when that gets published. The book, as you would expect from Osprey, has excellent production values. It’s hardback, full colour and 120 pages long The rules are well laid out and easy to read, whilst the layout allows for many side boxes with game developers comments, or ‘quotes from history’ of the fictional world. There are numerous photographs of example models, plus several full page illustrations. Horizon Wars was something of a (pleasant) surprise. I was expecting yet another sci-fi game with its own fixed universe and army lists, and instead Horizon Wars provides the players with a framework of rules and scenarios in which to game, whilst giving them complete freedom of army design. The universe of the rules is interesting, but is only an idea which the players can choose to use or ignore as they seem fit. The rules concepts are different enough to be interesting – which is challenge enough in a genre that has a large number of competitors – and is therefore not just ‘yet another set of small scale sci-fi rules’. Anyone playing Dropzone Commander, Planetfall, Dirtside or even Epic 40K can use their existing forces to play this new game. On a personal note, since the game uses ‘elements’ and these are not stipulated as being a particular size, the 6mm army that I have from the old Command Horizon rules, which have multiple vehicles on a base, has suddenly been given a new lease of life. For further discussion about Horizon Wars, including an interview with author Robey Jenkins, listen to episode 169 of the Meeples & Miniatures podcast.